The brain is the control center of the body. The slightest injury to any part of the brain will cause malfunction to some part of the body. The skull, under normal circumstances, protects the brain, but does not act as a full proof means of protection, especially when on a job site. Hard hats not only reduce risk of serious injury from falling objects, but they protect against minor impacts from items such as duct work, ceiling tiles, and machinery. The better care you take of your hard hat, the better care it will take of you. •Properly adjust suspension systems to maintain clearance between your head and shell of the hat. •Don’t cut holes for ventilation. Don’t heat and bend. •Don’t substitute a “bump cap.” They aren’t strong enough. •Don’t paint your hard hat. •Suspension – Replace every 12 months. •Entire Helmet – Replace every 5 years. •Never wear a ball cap under your hard hat. When a force strikes a properly fitted hard hat, the force is distributed throughout the entire hard hat and prevents force from concentrating at one point. It is important to inspect a hard hat each day prior to use as well as after an incident where the hard hat has been struck to insure the integrity has not been compromised. 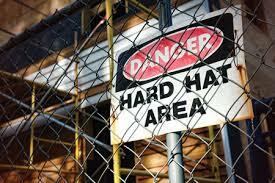 When a hard hat is damaged, replace the damaged part or replace the entire hard hat. When inspecting a new hard hat, ensure that it is the proper hat for the job and for the exposure to be expected. Also, make sure all parts are included with the hard hat. Be sure to follow the manufacturer’s instructions to assemble or attach the parts, and adjust the headband for proper fit; snug, but not tight. Reverse donning: Hard hats marked with a “reverse donning arrow” can be worn frontward or backward in accordance with the manufacturer’s wearing instructions. They pass all hard hat testing requirements, whether worn frontward or backward.